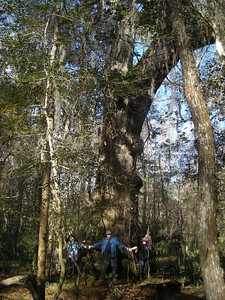 The Big Oak Trail is located within Suwannee River State Park and the Twin Rivers State Forest. The trail starts at the ranger station inside the park but can also be accessed from the Drew Mansion Ruins along old US 90 west of the Suwannee River, and from CR 141 just east of the Withlacoochee River. The trail follows the bluffs of both the Withlacoochee and Suwannee Rivers, with scenic views and some short rugged climbs. The Big Oak Trail features a loop trail in the northern portion of Suwannee River State Park, connected to the park’s day use area by segments of the Suwannee River and Ellaville sections of the Florida Trail and by park trails. Hikers follow both the Suwannee and the Withlacoochee Rivers and cross both rivers on bridges. The trail is blazed in two different colors: orange for the continuous Florida Trail and blue for the Big Oak Loop and the connector between the Florida Trail and the State Park Annex parking area. The parking area is west of the river off old US 90, where an interpretive side trail leads to the ruins of the Drew Mansion, once the plantation home of Florida’s reconstruction-era Governor. Parts of the Withlacoochee side of the loop follow an old dirt road which led to the ferry crossing between the defunct towns of Columbus and Ellaville, passing the second magnitude Suwannacoochee Spring. The Columbus cemetery may be seen along the Sand Hills Trail in Suwannee River State Park on the opposite side of the river. For more information contact the Suwannee Chapter.